Nikon Vision Co., Ltd., a subsidiary of Nikon Corporation, is pleased to announce the release of MONARCH HG binoculars 8x42 and 10x42. These are the most advanced models in the history of MONARCH binoculars, which are Nikon's representative binoculars that have garnered an excellent reputation around the world. MONARCH HG binoculars are made in Japan, feature an innovated exterior and deliver the finest performance among MONARCH models. That's because of the wide apparent field of view (60.3° for the 8x42 and 62.2° for the 10x42) that provides spectacular viewing. While achieving a wide field of view, the Field Flattener Lens System assures a sharp and clear view all the way to the lens periphery. The use of extra-low dispersion (ED) glass, moreover, corrects chromatic aberration that causes colour fringing, thus also realising a contrast-rich and high-resolution image. A high-quality multilayer coating is applied to all lenses and prisms. Dielectric high-reflective multilayer coating and phase correction coating are applied to the roof prisms. All this combines to achieve a bright view with light transmittance of up to 92% or higher, plus natural colour fidelity. The compact body is made of magnesium alloy and offers waterproof/fogproof performance (up to 5m/16.4 ft. for 10 min.) with nitrogen gas. This higher level of performance prevents fogging inside the optical system even in low-pressure environments up to altitudes of 5,000m/16,404 ft. equivalent. 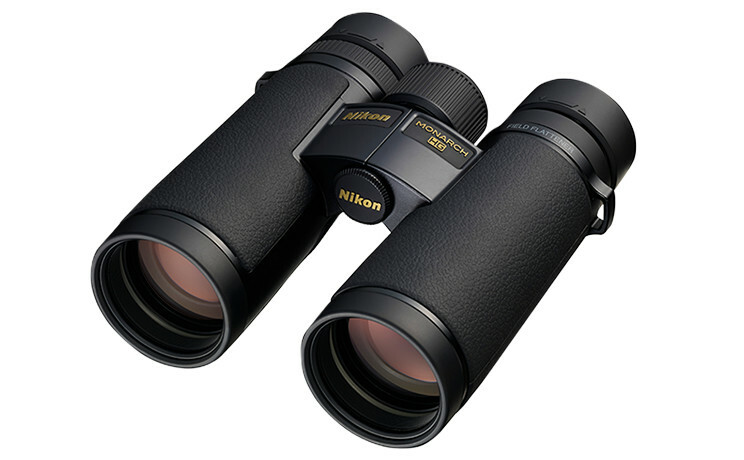 Nikon MONARCH HG binoculars are ideal for bird- or nature-watching, stargazing and many other kinds of outdoor activities. Note : Apparent field of view is calculated based on the ISO14132-1:2002 standard.